Tight end Rob Gronkowski returned to action against the Jets after being sidelined in recent weeks due to injury. Gronkowski immediately became Tom Brady‘s most frequently targeted pass-catcher and provided the highlight of the game with a long contested touchdown against cornerback Morris Claiborne. However, Gronkowski struggled to win his matchup against safety Jamal Adams, as he failed to haul in any of his red-zone targets. Rookie running back Sony Michel appeared to be healthy once again, and he was a pivotal part of the Patriots’ offense. Michel carried the ball 21 times for 133 yards and broke off some long runs and was successful at gaining yards after contact. Patrick Chung had his most productive performance of the season to date with a busy game in coverage especially. Chung didn’t affect very many incompletions, but he also didn’t allow the Jets receivers he was covering (and he saw targets against five of them) to convert short passes into longer gains, limiting the Jets to less than four yards after the catch per target. Stephon Gilmore, on the other hand, did step up and affect incompletions, as he shut out Robby Anderson on four targets into his coverage. Gilmore picked up an interception on a deep shot in the second quarter, high-pointing in front of Anderson and also picked up another pass breakup on the Jets’ final drive as well as cutting off Anderson or tying him up on other targets during the game. This was a strong bounce-back game after Gilmore’s rough outing against the Titans in Week 10. Adams showed Sunday why he’s regarded as one of the best young safeties in the game, as he stood his ground against Gronkowski in coverage. Furthermore, Adams made plays in the running game, as he often came up into the box, beat blockers and was a sure tackler against the Patriots. Interior defensive lineman Henry Anderson was the Jets’ best front seven player against the Patriots. While he only recorded three tackles, Anderson consistently beat blocks both in the running game and rushing the passer, as he got close to Brady on multiple occasions. Pressure was the story of the game for Josh McCown and the Jets. When his pass protection kept him clean, McCown was productive, completing more than 70% of his passes with a passer rating north of 100.0. When under pressure, both of those numbers dropped by around half, and that pressure was too often for McCown to keep pace with the Patriots even when the Jets’ defense held Brady and Co. under 30 points. Rookie tight end Chris Herndon continued his effective production of recent weeks with a career-high seven catches, converting three of those into first downs including a catch of 20-plus yards for the third straight week and coming up a yard shy of another a 19-yard gain. Herndon was kept quiet against the Patriots’ safeties, but when he was isolated on Dont’a Hightower he was a handful. 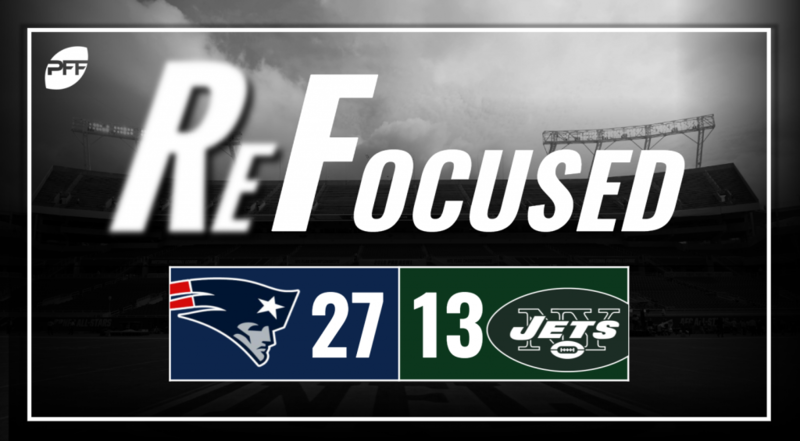 The New England running backs’ vision helped them find the open gaps and break multiple long runs in this game, which was too much for the Jets to overcome. The Jets’ offensive line couldn’t keep McCown clean enough for him to go toe-to-toe with Brady and the Patriots’ offense.